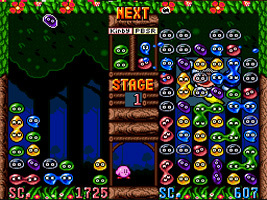 The popular Puyo Puyo puzzle game by Compile, starring Kirby and friends. Match up four blobs of the same color in any shape to make them disappear. If you match up more than four, or cause a chain of blob colours to vanish, then colourless blobs will be sent to your opponent which only vanish when the blobs around them are destroyed. You fight against a cast of Kirby characters and enemies that get progressively harder as you win stages.